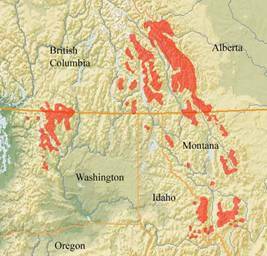 Two ranges exist, one in the North Cascades of Washington and the other in the Rocky mountains throughout Alberta, British Columbia, Idaho, and Montana (5). In the Cascades, L. lyallii is found east of the Cascade Divide from the Wenatchee Mountains (47° 25’N) to about 21 km into British Columbia (2). In the Rockies, L. lyallii extends from the Salmon River Mountains of central Idaho (45° 28’ N) northward to latitude 51° 36 in Canada (2). In its ranges, found from 1800 to 2400 meters (5900 – 7800 feet), and locally common on exposed northern alpine slopes to timberline (5). Grows in a very cold, snowy and moist climate, where for more than half the year, temperatures are below freezing and mean annual precipitation is 800 - 1900 mm (2). “Most alpine larch stands annually experience winds reaching hurricane velocity, 117 km/h (73 mi/h) or more” (5). Its uncommon and highly discontinuous distribution shows this species is adapted to a time when cooler, more extensive timberline habitat existed (3). “Many very fine stands are to be found in the eastern Cascade Mountains, including the Alpine Lakes, Glacier Peak and Pasayten Wildernesses, North Cascades National Park (WA), and Manning Provincial Park (BC)” (5). Very low shade and fire tolerance (5). Seral and “unable to compete with a vigorous growth of evergreens” (2). 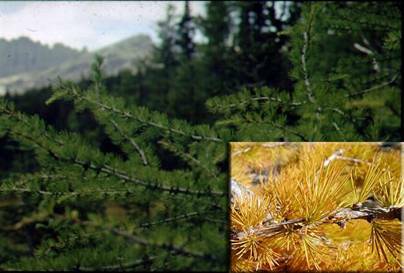 “Alpine larch is an intolerant, native, deciduous, coniferous tree”, and can be thought of as a pioneer species (3). It is superior in hardiness, and resists winter desiccation because it is deciduous, thus occupying a vacant niche in the highest of elevations and representing the potential climax (2). L. lyallii does not reproduce from sprouts (2), and it very rarely layers (has occurred in instances of krummholz) (3). Collect as seed. Collect in September (2). Large or modest seed crops are infrequent (3). L. lyallii does not produce appreciable quantities of seed until it is about 80 years old and dominant (2). Germination occurs at 15°C (1). “Seeds germinate in July soon after snowmelt”, and need full light and low temperatures (3). Daytime high temperatures and surface drought are lethal (2). “One month cold stratification helps germination” (4). Seeds are nondormant (1). Needs scarification - soak seeds for 24 hours in 3% hydrogen peroxide solution (3). Seed remains viable for up to 3 years (4). Store cold and sow in a cold frame in late winter. Sow seeds late in winter in a cold frame of outdoor seedbed, and give seedlings light shade for the first year (4). Germination appears most successful on a moist mineral soil surface on northern aspects. Grows on undeveloped, poor, soils; granite or quartzite talus which has not been occupied by vegetation previously. Ph = 3.5 to 5.7. “Mycorrhizal development was found on all trees...Cenococum graniforme has been identified as an ectotrophic mycorrhiza of subalpine larch” (2). Naturally, L. lyallii stocks itself in small groves at 125 to 200 mature trees per hectare (50 to 80/acre), with variable dispersion (2). Give effective weed excluding mulch and some winter protection at least one year after planting – if you cannot care for them through the winter, plant out in the summer of the following year (4). (4) "Larix lyallii” GardenBed.com. Plants for a Future. 25 April, 2005. <http://gardenbed.com/l/5902.asp>.